If you have severe acid reflux or GERD and are tired of taking medication to manage it, then LINX could be a solution for you. It's a permanent fix for acid reflux and is offered right here at Tri-County Health Care in Wadena. 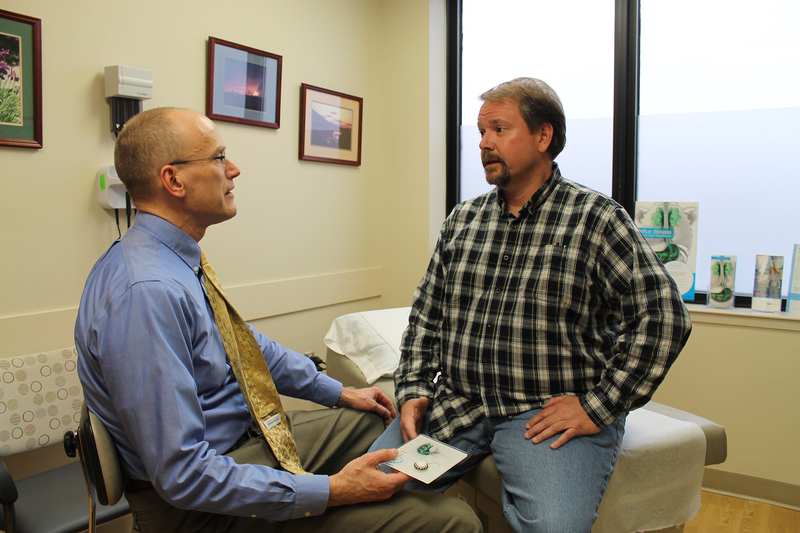 Ask your doctor how LINX could solve your acid reflux or call 218-631-7581 for a consultation. Tri-County Health Care of Wadena and David Kloss, M.D., FACS, are pleased to offer patients a permanent solution to chronic acid reflux. One of only nine hospitals in the state of Minnesota certified in the LINX Reflux Management procedure, Tri-County is thrilled to offer this potentially life-changing procedure for gastroesophageal reflux disease (GERD) sufferers. The LINX anti-reflux surgery has been used successfully in the United States for 10 years, and the results of this new surgery are excellent. Ganz, RA. Long-Term Outcomes of Patients Receiving a Magnetic Sphincter Augmentation Device for Gastroesophageal Reflux. Clinical Gastroenterology and Hepatology. May 2016. This is a minimally invasive, outpatient procedure, which means a small incision, less scarring, minimal pain, and patients can typically be back to work and life within 2-3 days. Ask your doctor if LINX is right for you or call us at 218-631-7581 to schedule a consultation with David Kloss, M.D., FACS. David Kloss, M.D., FACS, is a board-certified general surgeon specially trained to perform the LINX procedure. Call us today to set up an appointment with Dr. Kloss to see if LINX is right for you! More than 30 million Americans suffer from acid reflux each month, and the risk for developing gastroesophageal reflux disease (GERD) increases after age 40. The symptoms of GERD include such things as heartburn, regurgitation, sore throat, cough and chest pain. When left untreated, GERD can lead to serious complications such as esophagitis, stricture, Barrett’s esophagus and esophageal cancer. To manage their acid reflux and GERD, many Americans rely heavily on medications such as H2 blockers or proton pump inhibitors (PPI). However, recent medical reports have found that long-term complications can be caused by PPIs. For some, even the use of medication can't ease their painful GERD symptoms. The minimally invasive surgery LINX is an excellent alternative to long-term medication and does away with your symptoms for good. This treatment is performed as an outpatient procedure, it has minimal side effects, and it works to cure your reflux instead of simply putting a Band-Aid over the symptoms. Call 218-631-7581 to see how LINX could help your acid reflux. Before you can receive LINX surgery, Dr. Kloss will take a thorough history and perform necessary tests to evaluate your acid reflux or GERD symptoms. In-depth evaluation and testing help to ensure you are a candidate for LINX and will contribute to a positive LINX outcome. First, you will meet with Dr. Kloss to discuss your symptoms including how long you have had them and how much they interfere with your everyday life, as well as the medication you take to manage acid reflux and the side effects of your GERD or medications. After your consultation, Dr. Kloss will perform several tests to see if you are indeed a candidate for LINX. An endoscopy looks down your throat to see if you have esophagitis, which means your esophagus is swollen. Dr. Kloss can also see if you have other conditions that contribute to GERD symptoms such as a hiatal hernia (when part of your stomach bulges through your diaphragm) or stricture (narrowing of your esophagus). Dr. Kloss uses an endoscope, which is a tube that has a light and camera attached to it, to look into your throat, esophagus and stomach. You will be given a sedative or put under general anesthesia to keep you comfortable. A small capsule is temporarily attached to the side of your esophagus. This capsule can measure how much acid reflux is happening in your esophagus and sends that information to a receiver that you wear on your belt or waistband. The BRAVO test will last several days, about 96 hours. 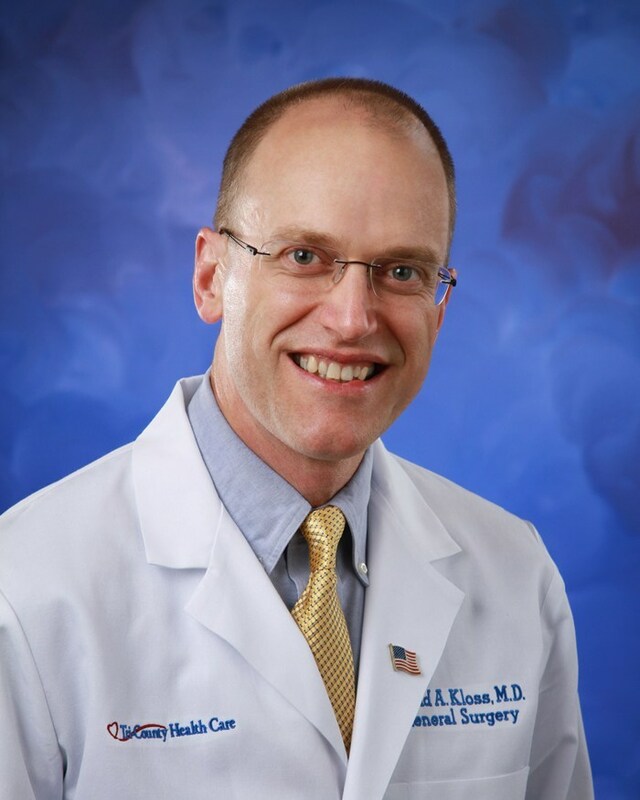 Dr. Kloss will look at your results and see exactly how much reflux is causing your symptoms. 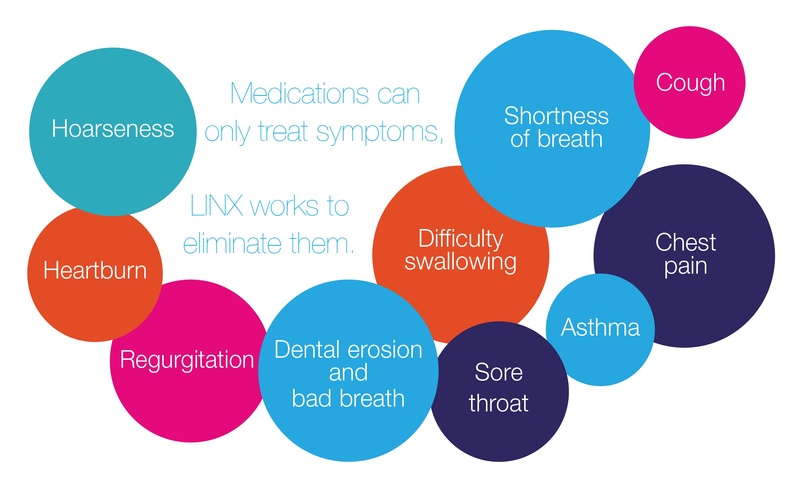 This test can help determine if LINX will be effective for you. After Dr. Kloss has guided you through the consultation and tests, he will determine if LINX is right for you and will help you take the next steps. 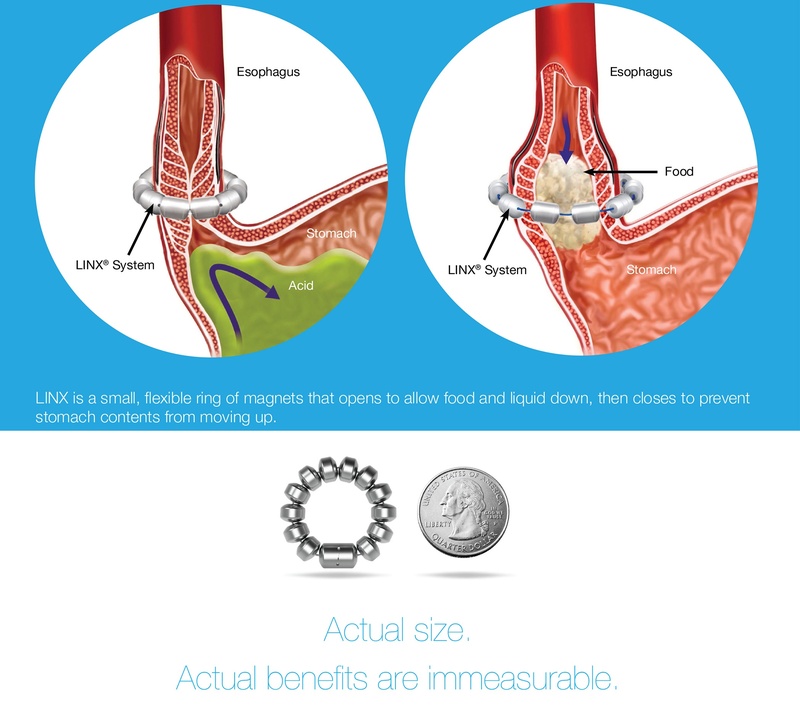 Dr. Kloss implants a small, flexible band of titanium magnets around your esophagus just above the stomach. The magnetic attraction between the beads strengthens the weakened muscles at the bottom of your esophagus, called the esophageal sphincter. The magnetic band is loose enough to allow food and liquids to pass normally to the stomach but immediately closes you swallow in order to prevent reflux. After the procedure, patients are able to resume a normal diet and will typically resume normal activities in less than a week. The surgery is typically done as an outpatient procedure.